Seamless coverage for a tight fit on each of the twelve pieces this lid corresponds with. 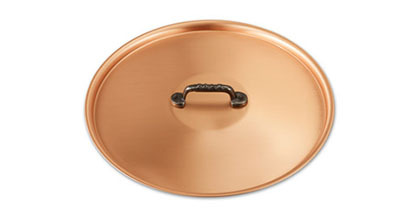 Satinated surfaces make clean up a breeze while the glowing copper compliments the ergonomic cast iron handle. Kepping your culinary assets covered. Falk Culinair. The Falk 28cm Copper transforms my 28cm Wok as a steamer, as well as a perfect vessel for creating curries for the family. 373 customers found this review helpful. Did you? Yes, I did! I purchased a 28mm Skillet a month ago from Falk. It was a delight to cook with. The sheer control of heat made it a joy to use. I decided that to top this pan I need to purchase a lid. This would open up yet more dishes from my somewhat limited cooking skills. I was right, now I cook rice dishes, stews, French Onion Soup, slow cooking the onion before adding the liquid and putting the lid on. I don't know if my tatse buds have changed, but I swear food tastes better from this pan and lid. I shall be purchasing another pot and lid soon. 496 customers found this review helpful. Did you? Yes, I did!